Who doesn't love a good curry?! The inspiration for this dish came when I received a sample of the Sweet Earth Curry Recipe Seitan satay-style. 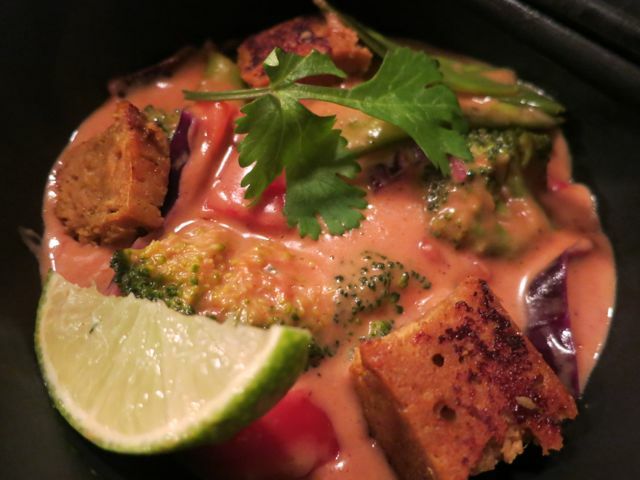 There is so much I can do with curry-flavor seitan, but the one thing I almost never make is my own curry. 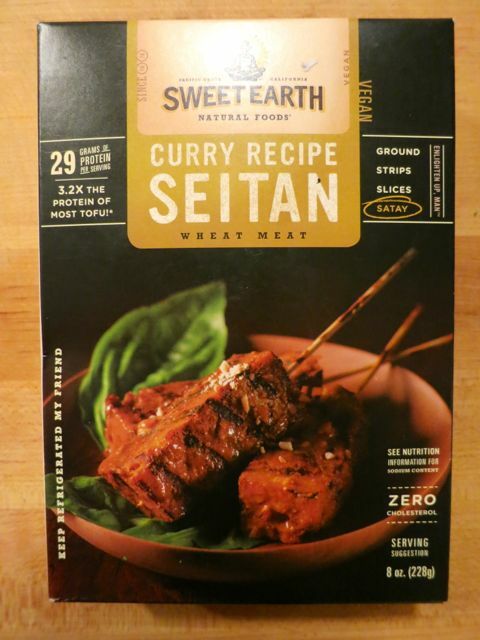 And Sweet Earth specifically states on the box that it goes quite well with peanut sauce. 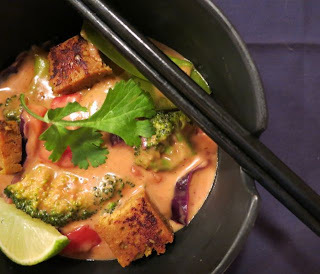 And with that, I was dreaming up a seitan and vegetable dish in Thai curry peanut sauce that I knew I had to create. I used a few products of note in this recipe. The first I already mentioned -- Sweet Earth's Curry Recipe Seitan. 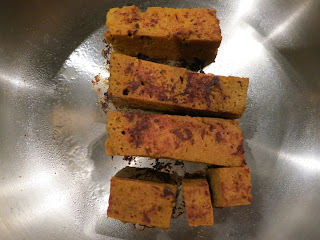 I've written about a few of their other products as well and have been very impressed with both the texture and flavor of their seitan. This one is no different. It is firm, but not too firm and chewy with a distinct curry flavor that works well in this dish. Sweet Earth products are currently sold in Whole Foods in California, Arizona, and the Pacific Northwest. Another product is the Organic Gourmet Miso Paste in Chili Pepper. 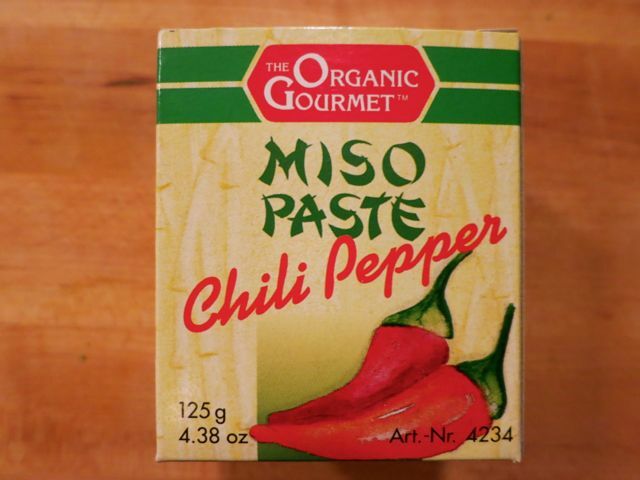 This great miso paste is produced by fermenting organically grown oats for months at a time. Miso adds natural carbohydrates, essential amino acids, vitamins, and minerals to a well-balanced diet and aids in the digestive process. 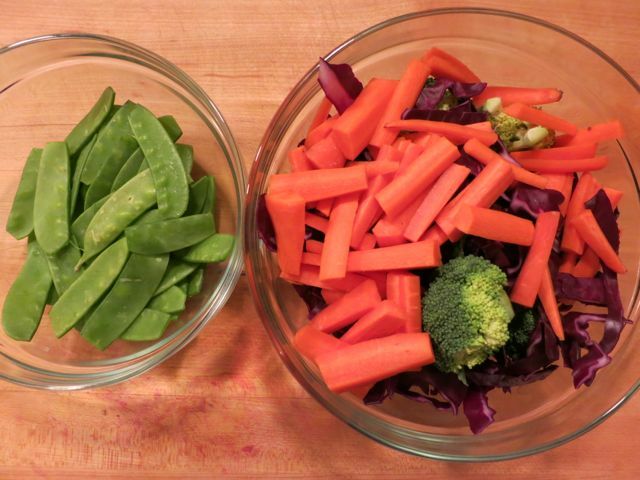 This paste is a great way to add some flavor to your curry while benefiting from the vitamins, minerals, and antioxidants in the miso. You can buy it at Vegan Essentials. 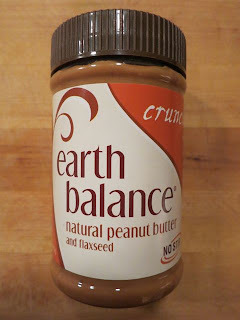 Lastly, I tried the Earth Balance Natural Crunchy Peanut Butter and it was just delightful. It is yet another great product from Earth Balance. If you can't find it locally, you can buy it on Amazon . Okay, on to the recipe! This curry has a rich, peanutty flavor with a little bit of spice. Anyone who loves a good peanut curry, will surely love this one. As soon as I tasted it, I was wishing that I had made more! Bring water and brown rice to a boil, then simmer over medium heat for 30-40 minutes until cooked thoroughly and tender, but not mushy. Heat oil in a large saute pan over medium heat. Stir in the garlic and cook for about a minute, stirring regularly so the garlic doesn't burn to the pan. Add the red curry paste and stir for another 30 seconds. Then, whisk the peanut butter, brown sugar, chili powder, cayenne pepper, miso paste, lime juice, sesame oil, and coconut milk together. Bring to a simmer, whisking occasionally for 8 minutes. Add the vegetables and cook covered over medium heat for 18-20 minutes, stirring regularly. 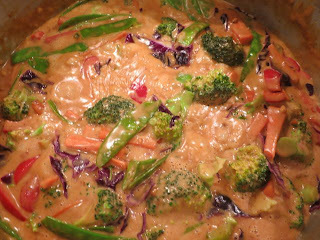 The vegetables will cook in the curry. In the meantime, heat a skillet on medium heat. Then, add cooking spray and cook the seitan until browned on all sides. Serve curry over rice and top with seitan and fresh cilantro. Serve with lime wedges. It is! Let me know if you try it!